Ok guys, I started this post at the end of last week, unfortunately my browser crashed on me and I hadn’t saved it (d’oh), so I thought I’d start again tonight. 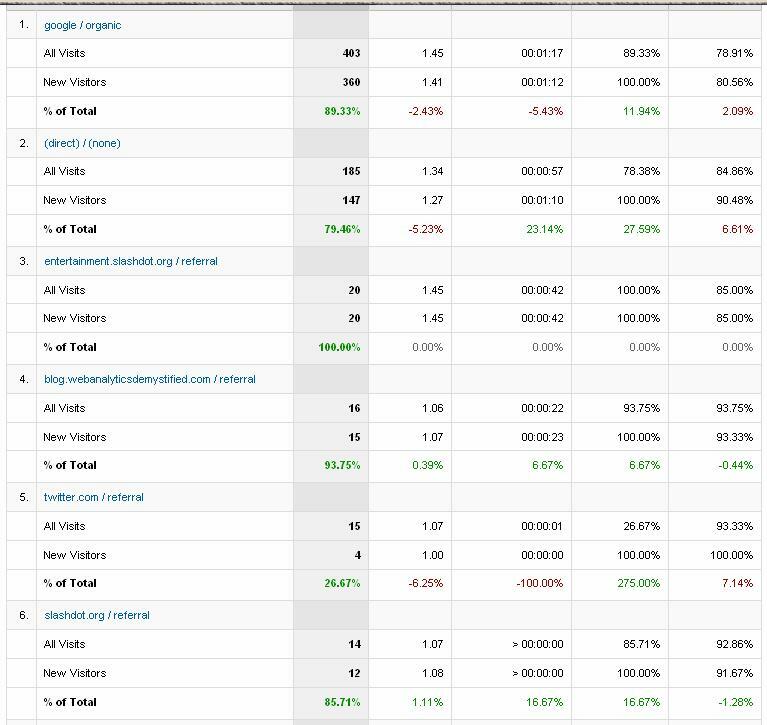 Basically Google Analytics has been given a bit of an upgrade and there are now some rather interesting features to the tool that you probably thought would never be there. Avinash Kaushik first announced them a couple of weeks ago on his blog. Then suddenly everybody wanted it, but they only let a few people have it if you knew someone whose brother worked at Google or something like that. Then when we’d all lost hope they gave it to the rest of us last week. There you go – you can see them on the left hand side (with the little red ‘Beta‘ next to them – can someone please explain to me what the hell is beta about it? I mean, everyone has it now, so surely it now just a bona fide feature?) – we have two new features that I’ll walk you through, starting with the bottom one upwards. 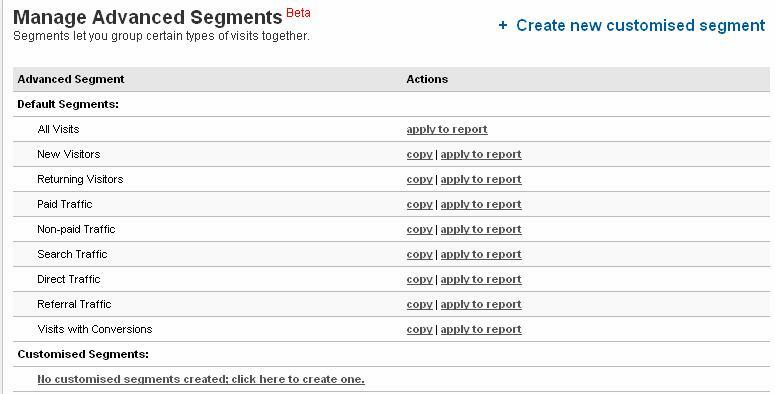 First off we have custom segmentation (whatever the funny name they give it in Google Analytics) where by you have two options of things that you can do. First you can pick up one of the segments that Google gives you. These are the segments that we’ve kind of forgotten about in the hysteria of being able to create our own new segments, when we’ve got some canned ones that everyone can see (more on that in a minute). But what do you do with these segments? 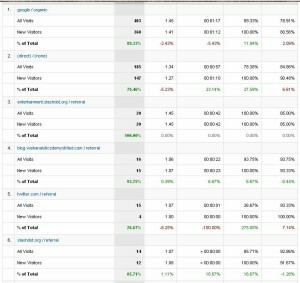 Well on my modest blog traffic (stop laughing) you can do very little with anything to do with conversions. Mainly because I don’t have any conversions (I’m sure I can come up with some memorabilia or whencanistop branded t-shirts if you really want, just drop me a mail :)), but I can see where this would come in useful. 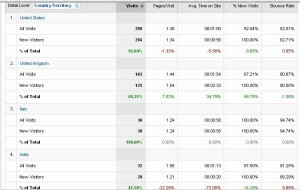 Sure you have your reports that tell you how many people complete your goals already for each of your traffic sources. But you can’t do this for your landing pages. Yeah sure, you can’t distinguish between your goals (if you have more than one) but then you can create a custom segment for that. Firstly if we look at our countries report, I’ve compared all visitors here to just my new visitors (Ciao to all those Italians out there – hope you’re finding this useful and fun). Here we can see that my UK users are much more likely to be repeat users (probably the people in the office, not to mention myself in several different browsers and different computers – hey you’ve got to get your numbers up somehow). That gives me a hint as to what I should be focusing these blog posts on (my regular readers, as opposed to those who find it once and once only). Do I have a UK slant? Probably very slightly (as proved in my annoyance at the MS Adcenter Analytics spelling). I think I’ll keep this British slant going in future posts (even if most of them aren’t really slanted towards any country). Always nice to see that the twitter readers are frequent fliers. I don’t know why this is though, because I don’t get mentioned on there that often (twice, if you’re interested – here is my handle and you can add to follow me if you really want). It’s fairly unsurprising that the slashdot readers aren’t frequent readers of my blog (we were talking about James Bond Gadgets, if you’re interested). I think I might have to pay more attention to my twitter users though. Also interesting that the Google visitors aren’t all new visitors – people must use Google to find me (I do get searches for my name and ‘whencanistop’ amongst other things). Anyway, lets move onto the real custom segmentation – because that is the most interesting bit of the new tool. Given what we were talking about last time (whether engagement was a metric or not), Eric Peterson wrote a clever follow up showing how you can use the segmentation to create an ‘engaged’ segment of people. I think this would be a great segment for everyone to create. 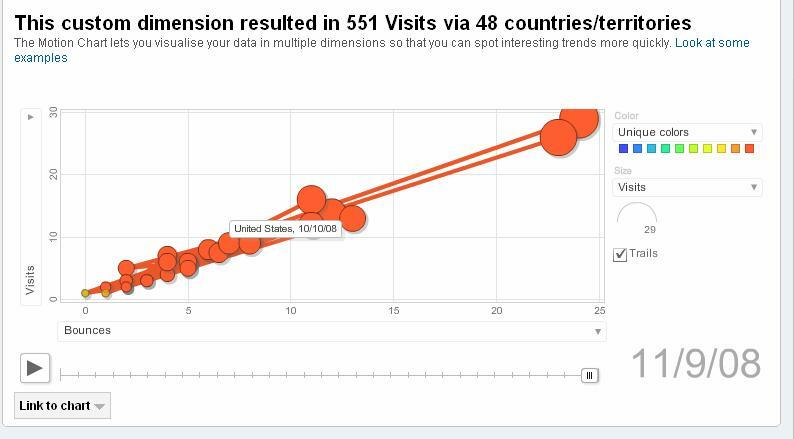 What we don’t get with these segments is any proper visitor segments (ie all these segments are based on visits). 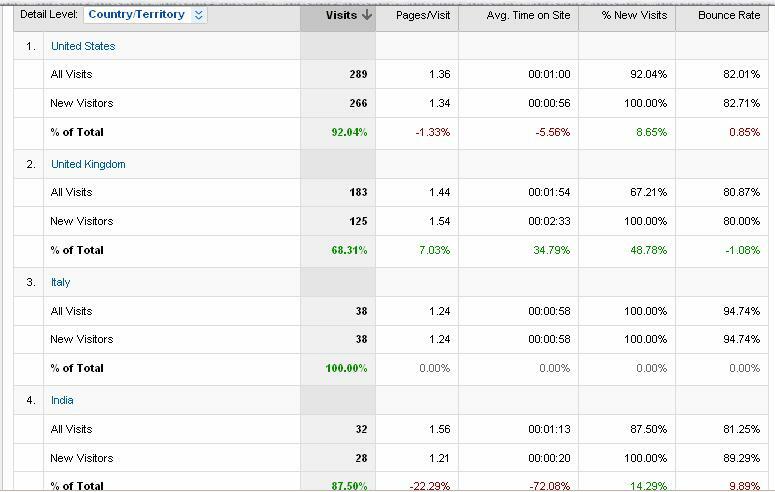 How many times do my new visitors visit the site? Once, because after that time they aren’t new visitors any more, so I can’t find out what else they do. How else do the search people get to the site? They only get there via search according to GA, because we can’t go anywhere else here. This is possibly a bit more exciting. Only a bit. Actually probably not at all, but I’m waiting for someone to come up with something we can do with the motion charts, bar throwing them in a pretty power point presentation for the management. Personally I’m quite interested in different visualisation techniques, so this looks like it could be quite powerful. I’ve just been playing around with it (I think the trails are really useful for those that aren’t connected to the internet) and I’ve got how many people are looking at the site by country and how many of them bounce. This is probably one of the least useful graphs, especially if you don’t get that much traffic, but if you get more traffic then you should be able to see proper trends in people moving around the site. Particularly if you have a growing audience in one country that is less likely to stay on the site. Again, goals can be important in this – make sure you set them up. The other advantage of the new reports (and not just the motion ones) is that you can now send a link to the reports and send them to people. This is great if you don’t want to copy numbers into a spreadsheet and create your own graphs. The downside being the person has to be connected to the internet, but hey – if I’m reading my email, I probably am connected to the internet. Overall – nice additional features. 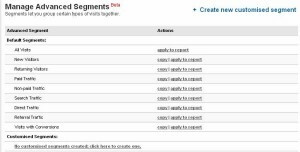 I think they’ll be really useful to everyone who uses Google Analytics. It’s not the Google way, but I hope they don’t rest on their laurels and keep updating the tool. If nothing else it is promoting a bit of conversation. ‹ Is Engagement a metric?